4 devices. 11 countries. 36 employees. 1 team meeting. 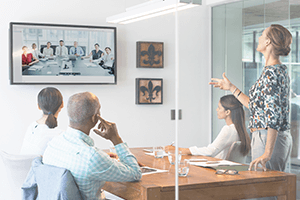 NEC will keep your organisation connected and communicating with our unrivalled suite of Audio and Conferencing products. Dial in to events via a web browser. Some say technology has made the world smaller. At NEC, we believe we are making the world and its population closer. 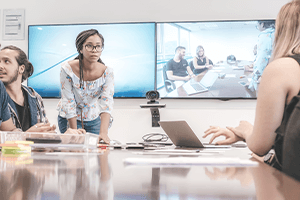 Our suite of Audio and Video Conferencing options enables up to 100 people from different corners of the globe to connect seamlessly using a single web browser. You can share your video, files and even applications in real-time. You can record conference content for instant playback and sharing. And you can do it all without the need for additional hardware – through your device, you simply connect and start your conference. It’s that easy. NEC makes conferencing a more personal experience. Easy connection and participation delivers enhanced sharing of information, diminished downtime and disruption and more satisfied stakeholders. This is the way conferencing was meant to be.